Fridge0 Refrigeration's qualified technician will come to you for Electrolux fridge and freezer repairs and services, no call out fee. Fridge0 offers same day service across the East and South East suburbs of Melbourne. The Electrolux brand name has been around since the start of refrigeration. Electrolux now is one of the biggest co-operations on the worlds stage, covering all appliances in the kitchen laundry household and more. They are also the main parts manufacturer for all their appliances that they produce. 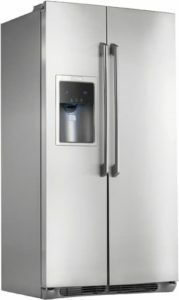 Electrolux is still producing good quality refrigerators with a vast range in upright, bottom mount, stand alone, French door, upright freezers, chest freezers and side by side. Electrolux designs seem to have been to remain basic and simple to minimize failure rate. which is sensed by a sensor in the fridge which relays temperature information to the main board. temperature and the temperature settings. everything inside the refrigerator starts to freeze up, no matter what the setting. this occurs, other components must be measured to eliminate the cause of the issue. also the PCB followed by the condenser fan motor and also the motorized baffle discussed above. usually have the LCD display module on the freezer door above the water and ice dispenser. PCB needs to be replaced but rarely does the display module need to be replaced. is either the refrigerator compartment starting to freeze everything or not cooling at all. Second most common issue with the side by side Electrolux refrigerators is the condenser fan motor. when one should check the back of the refrigerator by removing the back cover and observe the fan. stuck to the condenser coil.